We like spicy food even my little one does **eats with drinking plenty of warm water along side (laughing). Actually, I used sugar to ‘neutralize’ the spiciness. So, it is still acceptable by older children. Anyway, sugar acts as ‘flavour enhancer’ to the dish. So, instead of using MSG, I prefer to sprinkle a little bit of sugar to my cooking, especially fried/ pan-fried dishes. No worries, a pinch of sugar would never enough to make the dishes taste sweet. I placed a leaf of lettuce on the serving dish, and then placed the prawns on top. This way, it decorates the dish, at the same time, helps to create a diet of seafood and vegetables. You can also eat the lettuce as refreshment after spicy prawns. This dish goes so well with nasi lemak (coconut milk rice) and even plain white rice. Its sweet-spicy taste and aroma surely indulge you for more bowls of rice! Let me remind you on the calorie intake. 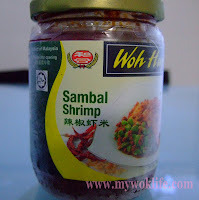 Consumption of 3 Sambal prawns counts about 200 kcal. A regular bowl of rice adds another 194 kcal. Very simple steps to follow that almost considered this recipe as instant cooking, but it’s with fresh and nutritious ingredients though… My recipes target express cooking, you’ll surely have this dish ready in a flash! 1) Heat a wok with oil over medium-high fire. Put in garlic and fry for 30 seconds, or until golden brown and fragrant. Reduce heat. Add sambal paste, lightly scramble and stir fry for 1 min, until fragrant. Beware of the pungent smell from the paste when first added to the heat. 2) Add prawns, and stir for 3 mins. Drizzle some water, and sugar. Cover lid and simmer for 3 mins, or until prawns pinked. 3) Place a leaf of lettuce on a serving dish. 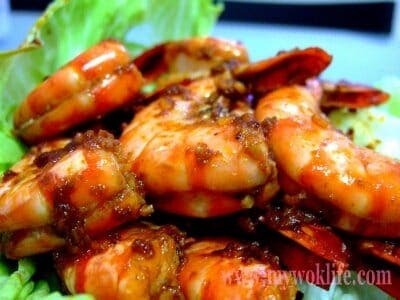 4) Transfer prawns to the serving dish and serve with hot steamed rice. It is not that difficult to make your own sambal paste (I’ll share with you next time), only if you have a more relaxing weekend to spare. For working parents or even working couples, like you and me, using readily-made paste should be the best alternative to prepare for nice and delicious HOMECOOKED food, even in normal weekdays, for your loved ones. Tips: Sugar acts as flavour enhance to your cooking. Add sugar rather than MSG.